The Mohawk Council of Kahnawà:ke has been informed by the Jacques Cartier & Champlain Bridges Incorporated and the Ministère des Transport du Quebec that closures will take place on the Mercier Bridge this weekend on the following schedule. 3 am to Sunday at 8 am - closure of one lane towards Montreal from for repairs to the slab. 6 am to 9 am – Partial closure of the Kahnawà:ke-bound left lane in the area over the Seaway for minor maintenance. Only minor impacts on traffic expected. 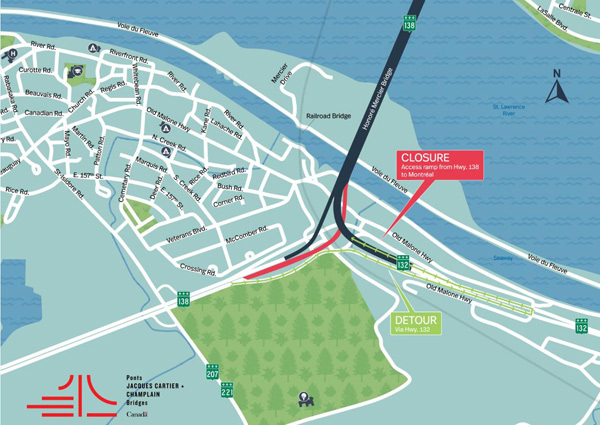 7:30 am to 5 pm – Closure 138 east on-ramp towards Montreal for repairs. Detour via 138/132 east service road to 132 west up-ramp. Delays expected during peak times.